Sanding is a fundamental part to the finishing process. In other words, if you foul up this key process, you wreck the whole piece. 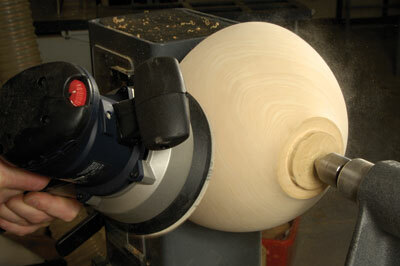 Commonly accepted sanding processes are hand sanding and power sanding using an arbor fitted into a drill. I have long contended that we are probably missing some opportunities to achieve better sanding results by utilising tools we are likely to already have in the workshop. The two tools that I regularly use are a random orbital sander and a delta sander. The rule of thumb is the larger the piece worked on, the larger the surface area the abrasive should be in contact with. This is obviously difficult on external work but on internal work, this guideline can be followed very easily. This results in purer curves and less surface undulation. By using a 125mm (5in) random orbital sander, we not only use rotational speed (which with some makes of orbital sander is variable), there is also an orbit oscillation. This does away with the radial marks left by the arbor and drill methods and, in my opinion, results in a better finish. The downside is that it can't be used up against clearly defined and raised detail such as beads, carved detail and so on. Mind you, nor can sanding with an arbor. However, for pure forms there is no problem. This type of sander is easy to manipulate. The grits range from 60 grit to 1000 grit and are available from various manufacturers. One is able to tackle a full range of projects with such a tool and very little time is required to master the technique. The trick, as with using an arbor and a drill, is to work out what part of the disc you need to have in contact with the work at any one time to achieve the best finish. So, if you have one, give it a go! You will be very surprised by the results and it may well give you a better sanded finish than you are currently achieving. To many, a delta sander, often called a detail sander because of its triangular sanding pad, is used for getting into mouldings, awkwardly shaped areas, skirting, windows, doors, and so on. There have been many times we have used carving and other forms of enhancement techniques on turned work which has then required sanding to the areas to achieve the final finish. Hand sanding is the likely method, but you could find yourself in a situation where the delta sander is the better option. Not only can it reach into the carved decorated areas, but also, because it oscillates, a finer finish is acheived quicker than the conventional hand sanding method. With some makes an extension tip is supplied as an accessory which allows you even finer control and longer reach into the work. It also sports variable speed. If you are into carving and enhancing your work in such a way, this is well worth exploring and it is likely to save you a large amount of time. Many grades of abrasive are available but if you require ultra-fine grades, consider buying loop-backed abrasive rolls or discs and cutting them to shape yourself. Many of the top professional turners and sculptors have been using these tools for years but we seem to have been a little slow to catch on. This is a sad situation and we should not be hide-bound to current techniques. Whilst more conventional methods work, you may find that with a little experimentation, there are tools out there that will help you in the journey towards achieving the perfect finish. 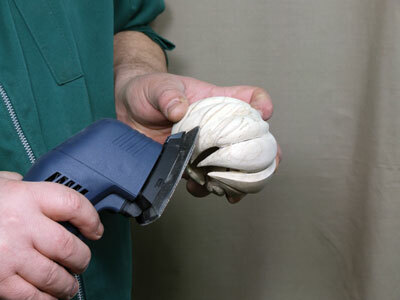 "The two tools that I regularly use are a random orbital sander and a delta sander"